Vinod Murali, managing director at InnoVen Capital, the largest of the three most active venture debt firms in India, feels that the low penetration levels of venture debt in India would mean there is still enough scope to grow. Venture debt, says Murali, is “intended to make the strong stronger”. “In the US, the total venture capital market is of the order of $50 billion, out of which about $6 billion is venture debt,” says Rahul Khanna, managing partner at Trifecta Capital. “Typically venture debt comes from three sources--specialised banks, publicly listed funds and private vehicles, which are mainly closed-end funds,” he adds. 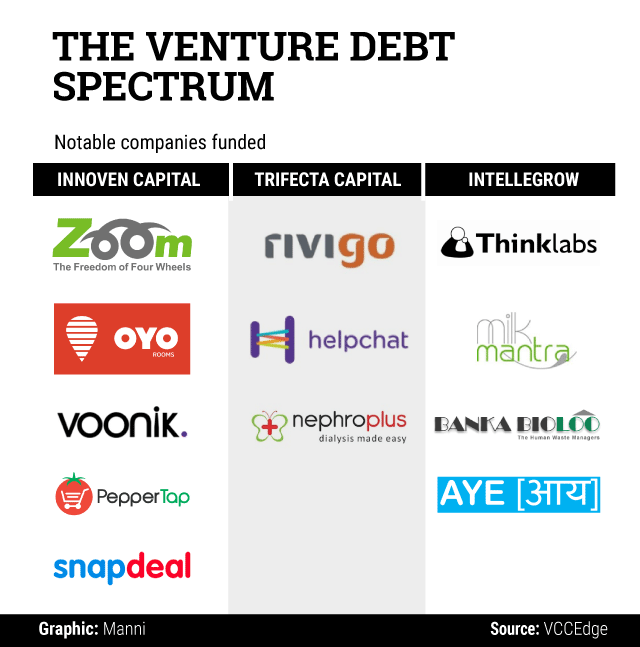 However, venture debt funds lend only to those startups that are able to raise incremental equity. “We are happy to take execution bets, but we are not happy to take concept bets,” says Khanna. Apart from Mumbai-based InnoVen Capital and IntelleGrow Finance, Delhi’s Trifecta Capital Advisors, Bangalore-based Capital Float, IFMR Capital of Chennai and Ahmedabad-based Lendingkart are among a growing number of companies that offer debt funding to early-stage companies. Several executives who spoke to VCCircle for this report cited significantly higher numbers of deals inked individually by them. “In the last month alone we have done 14 deals, and since April, we have clocked 72,” says Nitin Agarwal, deputy chief executive officer at IntelleGrow Finance Pvt. Ltd.
Another risk that lenders face is late payments. Ajay Hattangdi, chief operating officer at InnoVen Capital, says that although defaults remain minimal, creditor rights in India are not protected, which remains a worry. “Having said that, our losses are below 1%,” he says.